One of the biggest myths about couponing is that you can ONLY find coupons for junk food. While it is certainly easier to find coupons for food products, you can also save money and use coupons while still eating healthy! I have couponed through a low carb diet, and even through the Whole30! It’s harder and you certainly don’t save as much as you would if you were eating whatever you can get for free or cheap, but it certainly helps us afford a healthier lifestyle. We do most of our shopping at Safeway. They have a “club card” which gets you not only the sale prices, but also tracks your gas rewards. They also have the Just4U app which loads e-coupons onto your phone and your card. They often have coupons and “personalized prices” based on what you buy most often. Many of them are for things that don’t traditionally get many coupons. If you find that eating healthy/organic/clean is costing more out of your pocket than you’d like, try couponing for the “other” items you use. Things like condiments, toiletries and household goods can often be free after coupons with a little effort. Focus your couponing time on those items to compensate for the fact that you’re spending a bit more on groceries. Often you will find coupons stuck to things you use. I’ve seen coupons stuck to packages of chicken, usually for a discount on a complementary product (like barbecue sauce) when you purchase the chicken. Look for coupons for any items you regularly use. I also encourage you to look for “blinkie” machines (those little Smart Source coupon dispensers). Recently, we found a blinkie for $5 off a new brand of cat litter. A week later, my store had them on special for $5 Friday and so we got FREE cat litter! One of my favorite days is the first Tuesday of the month. That’s the day when Safeway puts out their $10 off your $50 purchase coupon. I break my trip into 2 or 3 transactions totaling $50 each and use a $10 off coupon on each one (in addition to any other coupons and sales). These “$ or % off your whole order” coupons can really help especially when certain items don’t have sales or coupons often. My store also often has a coupon for so many cents off per gallons of gas when you spend a certain amount. These coupons can totally add up to big savings! Apps like Ibotta and Cartwheel can give you bonus savings on items that may or may not otherwise have coupons. Ibotta is a great one that I love to use. In fact, if you sign up for Ibotta through this link, they’ll give you $10 credit right off the bat to start you out. We’ve saved A LOT over the years using Ibotta! They also offer bonuses for completing certain challenges. Right now for example, you can get ANOTHER $5 if you redeem 6 rebates during the month of August. Also, check out the 5 money-saving apps you need to use. Not all stores do this, but ask at the meat department. Our store marks meat down to 30% off in the day or two before its sell-by-date. The day of the sell-by-date it goes down to 50% off. If you’re quick, you can stock up on meat for a fantastic price. Just be careful, I have wound up with some questionable meat because I wasn’t paying attention and wound up having to toss it the next day. Clearance meat will either need to be used the day its purchased, or frozen same-day. If you play your cards right, you can get some excellent deals on meat this way! One of my favorite ways to buy chicken is from Zaycon, which allows us to buy 40 pounds at a time for a rock-bottom price. Right now chicken is just $1.49/lb at Zaycon (with coupon code SUPER12) which is FAR better than I can get it at the grocery store (not to mention, its fantastic!). You can store all 40lbs (I recommend portioning them out first!) in your chest freezer, or you can split the order with a friend or two so that it’s more manageable if you don’t have the freezer space. We saved a bundle last year doing this and plan on doing it again this fall. That way, you stock up on meat when its dirt cheap and you don’t have to buy it again for a while! Zaycon also offers other meats like center cut pork loin chops, Kansas City strip steaks, ground turkey, salmon and lobster tails, all of which are 12% off with Zaycon coupon code SUPER12 You can also see about going in on a side of beef from a butcher with a co-op group. Search for local co-ops on Facebook to find one near you! Using these tips, you can save big on groceries even if you have specific dietary needs or you are trying to eat healthy. Healthy foods don’t have to cost a fortune, you just have to get a little creative! 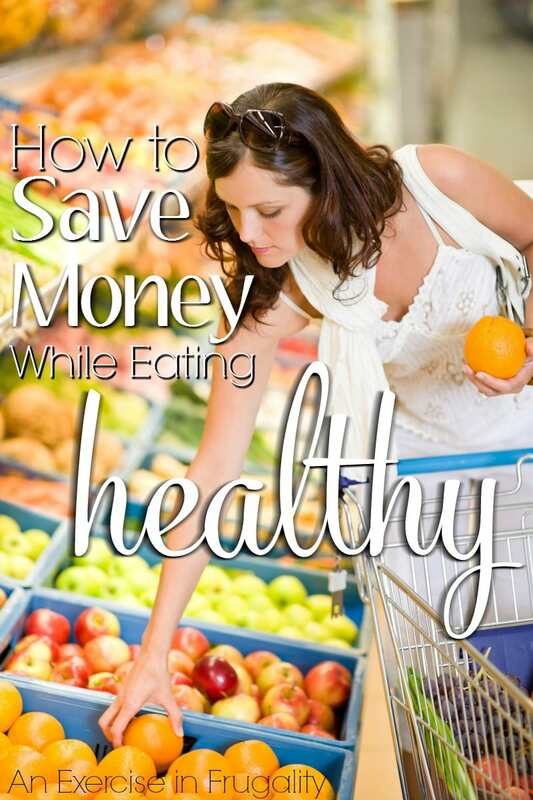 What other tips do you have for saving money on healthy food? Surprisingly I have found my local butcher shop to have amazing seasonal sales! I studied each shop and found the one with the best sales, then buy in bulk in freeze. I also love knowing it is fresh and local. I also love the whole basket coupons at my grocery! !